With the magnificent Midtown Mile to the left, picturesque Piedmont Park to the right, world-class culture next door, the hottest clubs in the zone and specialty shopping everywhere, youre in the middle of it all at W Atlanta - Midtown.Live, work and play in our Midtown Atlanta hotel. Savor TRACEs farm-to-hotel cuisine, lounge in the Living Room, find Bliss at the spa or raise the roof in Altitude, a meeting venue above the city.Southern comfort and hospitality meet contemporary luxury and sleek chic. Bask in luxuries like state-of-the-art entertainment and technology, the W signature bed and Bliss bath amenities. Let us pamper you with Whatever/Whenever service. 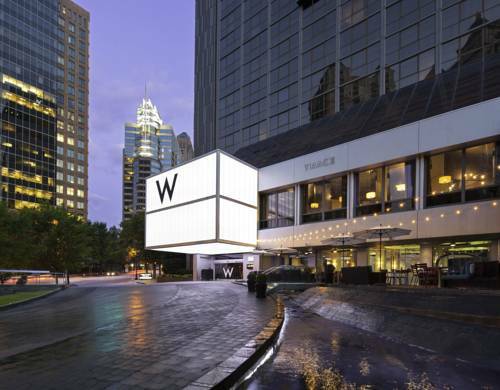 The city's heart of the arts, mecca for retail therapy and the muse for top-notch entertainment is yours for the taking, all packaged into 15 blocks of chic lifestylin' where the W Atlanta - Midtown is in the middle of it all.And there's more beyond the neighborhood. Venture out to only-in-Atlanta experiences as you feel the pulse of 24/7/365 media on a CNN studio tour or Tomahawk chop at Turner Field, home of the Braves. Pop bottles of famous fizz from across the globe at the World of Coca-Cola or tee off at legendary golf courses set against stunning mountains. Relive history through the footsteps of Martin Luther King Jr. or zip through storied enclaves on a Segway ghost tour.Home to numerous Fortune 500 and blue chip companies, why not mix business with pleasure when you're in town? 404 might be Atlanta's area code, but by our unbiased (wink) count, it's also how many things you can do here on any given day. Who wants coffee? Our W Caf opens early and closes late. Jump-start your day or recover from the night's revelry with a good hot cup of java.